AlSat 1 (Algerian Satellite), a 90 kg enhanced microsatellite is Algeria's first national satellite and has been designed and constructed by SSTL at the Surrey Space Centre (UK) within a collaborative programme with the Algerian Centre National des Techniques Spatiales (CNTS). AlSat 1 is part of a wider international collaboration to launch the first constellation of Earth observation satellites specifically designed for disaster monitoring. The AlSat 1 enhanced microsatellite carries specially-designed Earth imaging cameras which provide 32-meters resolution imaging in 3 spectral bands (NIR, red, green) with an extremely wide imaging swath of 600 km on the ground that enables a revisit of the same area anywhere in the world at least every 4 days with just a single satellite. AlSat 1 is the first satellite in the Surrey-led Disaster Monitoring Constellation (DMC) which will comprises 5 microsatellites in low Earth orbit by the end of 2003. A joint British-Algerian team of SSTL & CNTS engineers successfully completed the manufacture and pre-flight testing of the enhanced microsatellite during a 15-month programme which included know-how training for the 11 Algerian engineers and scientists at SSTL in England. A mission control ground station has also been installed by SSTL at CNTS in Algeria and engineers are carrying out final checks there in readiness for the launch. 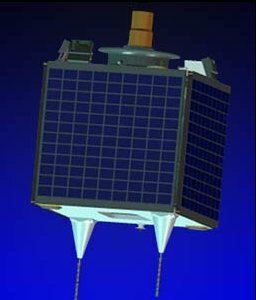 In mid-2003, following the validation of AlSat 1 in orbit after launch, a further 4 microsatellites were launched into the same orbit as AlSat 1 to complete the DMC constellation and provide a daily imaging revisit capability worldwide. SSTL is building these microsatellites in collaboration with Nigeria, Turkey & the UK.